A new and modern facility for the treatment of radioactive effluent from decommissioning is set to come into service at Dounreay. Built at a cost of £7.5 million, the Low Level Liquid Effluent Treatment Plant will set new standards for the management of effluent from the clean-up of the former experimental reactor establishment. Site operator UKAEA today welcomed confirmation that it has been granted formal consent by the Scottish Environment Protection Agency to begin active commissioning. The new plant will be phased into service over the coming months. Site director Peter Welsh said: "The development of this new facility underlines the commitment we have given to decommission Dounreay to high standards of environmental protection. I'm pleased that SEPA has granted consent to bring this new plant into service." The new plant, which took three years to build, will collect effluent from a variety of facilities now being decommissioned at Dounreay as well as the neighbouring Vulcan test site. The effluent will pass through a series of treatment tanks and checks before being disposed. "We will gradually phase in the new plant and build up experience of its operation during a period of commissioning. Once it becomes fully operational, it will set new standards for how we manage effluent from the decommissioning of the site." The Scottish Environment Protection Agency (SEPA) has made significant changes to the authorisation covering UKAEA Dounreay's discharges of gaseous radioactive waste. The changes mean a cut of 59% in the quantity of tritium that the site is allowed to release to the environment and will come into effect on Friday 18 July. The change also permits the operation of UKAEA's new facility for collecting and disposing of liquid waste to sea. This facility, known as the Low Level Liquid Effluent Treatment Plant (LLLETP), will replace the old sea discharge tanks that were the subject of a SEPA enforcement notice in January 2002. · how it will comply with the government's international environmental commitments. SEPA is also finalising a similar downward change in the limits controlling liquid waste from Dounreay, where there is greater scope for reduction. This has been brought about by UKAEA's move away from reprocessing, to a mission of restoring the environment. There may be scope for further reductions in the authorised limits for the disposal of gaseous and liquid waste. These will be explored and detailed by UKAEA in a new application for the disposal of radioactive waste from Dounreay. The application will be made to SEPA during 2003 and will be subject to full public consultation. The changes now being made and those being finalised by SEPA are considered to be interim measures while UKAEA finalises its application for a new authorisation. This application will be supported by UKAEA's plan for the environmental restoration of the Dounreay site. SEPA will consult the public about the application and expects that the new authorisation may be in place by 2005. Tom Inglis of SEPA said: "The point of the changes is to help ensure that there is efficient and robust regulation of the site. They will continue the downward pressure on the disposal of radioactive waste to the environment and will ensure that our authorisation is appropriate to the new focus on decommissioning." · Under the international OSPAR agreement, the government is committed to reducing radioactive discharges to the environment. · In 1999 SEPA issued an authorisation to UKAEA for the disposal of gaseous waste. UKAEA applied for a variation to this authorisation so it could operate its new sea discharge tanks (the facility produces a small quantity of gas also). the authorisation at any time. · This process began in August 2000 when SEPA and UKAEA discussed the operation of its proposed new sea discharge tanks. Public consultation on the changes took place from May - July 2001. Additional consultation and discussion has taken place with the Nuclear Installations Inspectorate, the Food Standards Agency and the Scottish Executive. available on www.sepa.org.uk/dounreay from Thursday 17 July. take routine readings of the ventilation system and other systems. 2001 at a cost of £7.5m replaces the D1211 Effluent Plant constructed in the 1950s. done by reducing the velocity of the effluent thereby allowing the solvent to rise to the surface. Suspended solids within the incoming effluent lines will settle in this tank due to the low velocity. The solvent will be removed periodically from the top of the effluent by gravity into a solvent collection section. The solids/sludge collected at the bottom of the tank can be removed as determined by readings from a sludge concentration-detecting instrument in the bottom of the tank. Flushing water is supplied to the tanks in order to facilitate sludge removal. It is estimated there is 10 years sludge storage space in these tanks and one option for the future treatment of this sludge is to cement it and release it as Low Level Waste. From the Gravity Receipt Tank (GRT) the Effluent is transferred to the buffer tank which has a capacity 3 of 300 m . It is then passed through a two stage neutralisation plant in order to control the pH of the effluent which is to be discharged to sea (the effluent enters the plant with a discharge between 2 to 12 and leaves the neutralisation plant with a pH between 5 and 9). Adjusting the pH of the effluent, reduces the impact on the environment and meets the latest discharge criteria. required by the regulatory authorities. Effluent from the Low Active Drain system flows into the gravity receipt/solvent separator tank. The tank is below ground level to allow effluent to flow continuously from the drain lines by gravity. 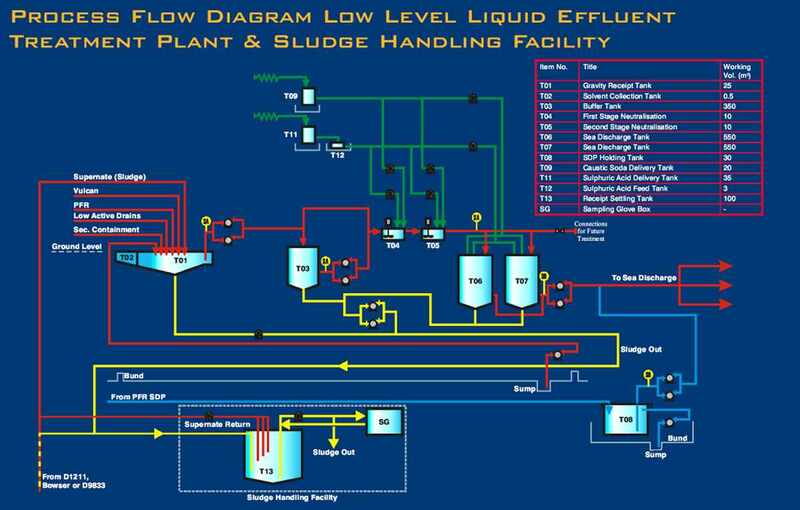 Effluent arrives periodically from PFR, Vulcan, Fuel Cycle Area and other sources.